Food has functioned both as a source of continuity and as a subject of adaptation in the course of human history. Onions have been a staple of the European diet since the Paleolithic era, while the orange is once again being cultivated in great quantities in Southern China, where it was originally cultivated. Other foods--such as the apple and pear in Central Asia, the tomFood has functioned both as a source of continuity and as a subject of adaptation in the course of human history. Onions have been a staple of the European diet since the Paleolithic era, while the orange is once again being cultivated in great quantities in Southern China, where it was originally cultivated. Other foods--such as the apple and pear in Central Asia, the tomato in Mexico, the chili pepper in South America, and rice in South Asia--remain staples of their original regions and of the world diet today.Still other items are now grown in places that would have seemed impossible in the past-bananas in geothermally heated greenhouses in Iceland, corn on the fringes of the Gobi, and tomatoes in space. But how did humans discover how to grow and consume these foods in the first place? How were they chosen over competing foods? How did they come to be so important to us? In this charming and frequently surprising compendium, Gregory McNamee gathers revelations from history, anthropology, chemistry, biology, and many other fields, and spins them into entertaining tales of discovery, complete with delicious recipes from many culinary traditions around the world.Among the 30 types of food discussed in the course of this alphabetically-arranged work are: the apple, the banana, chocolate, coffee, corn, garlic, honey, millet, the olive, the peanut, the pineapple, the plum, rice, the soybean, the tomato, and the watermelon. All of the recipes included with these diverse food histories have been adapted for recreation in the modern kitchen. 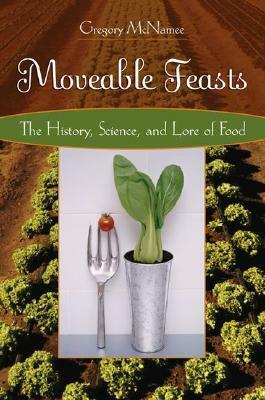 I find the history of food and its origins absolutely fascinating. So informative, yet still funny, engaging, and readable.